Coming out in jammies and slippers -- all I'm missing is a head scarf. I woke up like this? No, not at all. I'm not a true lady of the house by any sense of the definition, but this is certainly the type of outdoor look that I could just as easily wear indoor. But I have embraced the pajama set trend, even if just for one or two styles. I think this trend looks best in a silk style with long pants, which is what I really wanted, but I opted for a shorts set since summer is coming. My eye first went to this Forever 21 set when I saw my Insta friend Tracey wearing it a few weeks back. And when this ASOS set that I wanted didn't pan out, I knew I had to re-visit this shorts set. This might not be your style when it comes to outdoor wear, but I know you can appreciate the allover floral print and the contrast piping. 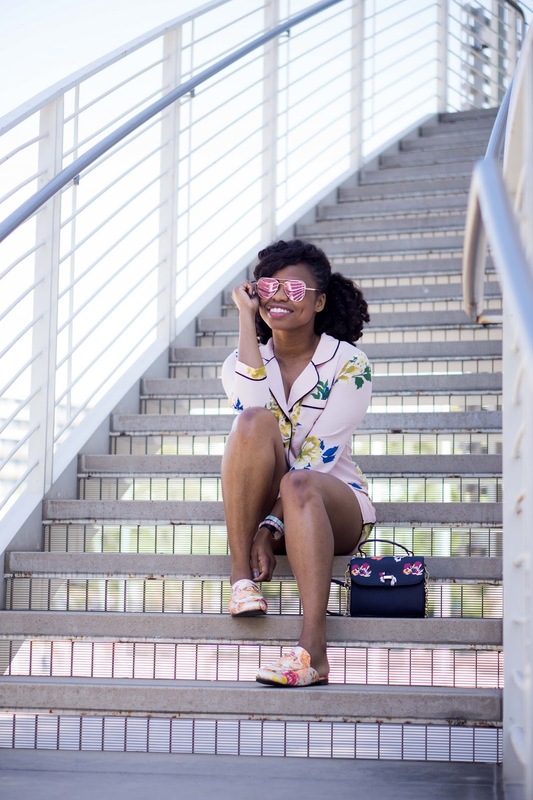 And I finally had the perfect look to style with my apricot floral mules. 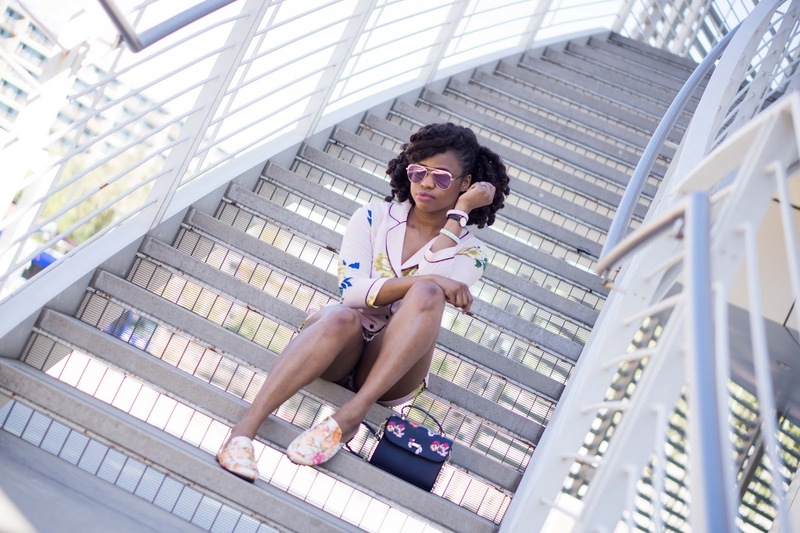 If you want to try out the pajama trend, but aren't really sure how to approach it or if you're yet ready to rock indoor wear outside, then I do have a tip! I suggest starting with one piece at a time. This woven pajama style shirt and this contrast piping shirt are great ways to rock the pajama trend without looking like you're ready to go to bed. And this week I started a new workout and diet plan. I'm trying to get back to the body I had a couple years ago before I turned 30, lol. Zoe Kravitz is my inspiration. Wish me luck! Super cute set! I love pj sets and these are summer perfect! I'm still unsure of the PJ trend, but I do like the set you are wearing! It is pretty! This is adorable! I haven't tried the pajama trend yet, but this making me want to give it a whirl! That is such a cute pj set! I have a similar outfit post coming ... hahah!!! 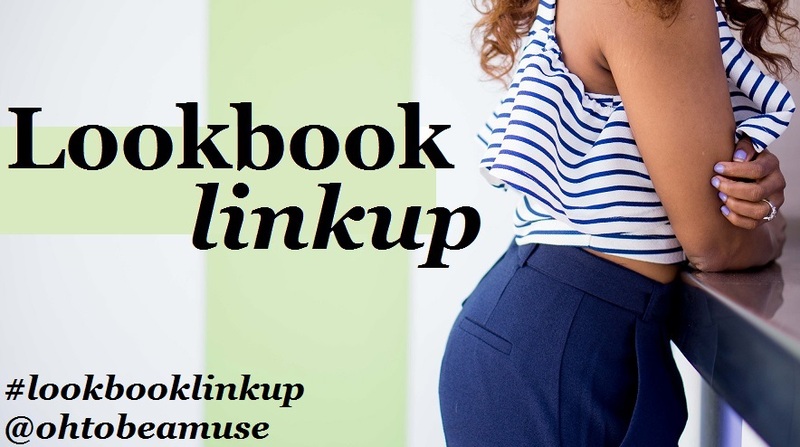 You are totally ROCKING this trend. Good luck with the workout plan! I am OBSESSED with this pajama set! The floral print is so pretty! I love this F21 set! Although I don't think I can pull off this pyjama trend, I really do love it on others, and yours rock! I love this look on you! I hadn't really gotten into the PJ look but actually prefer the look with shorts. This is such a chic way to rock the pj trend! The contrast piping is everything! SO very cute Cheryl. I like the idea of embracing it little by little and I'd probably go with the long pants version. I love it! The pajama set looks awesome on you :) And it's such a beautiful pattern too! These are sooo cute and look crazy comfortable! Love!! I'm obsessed with this look! How fun! 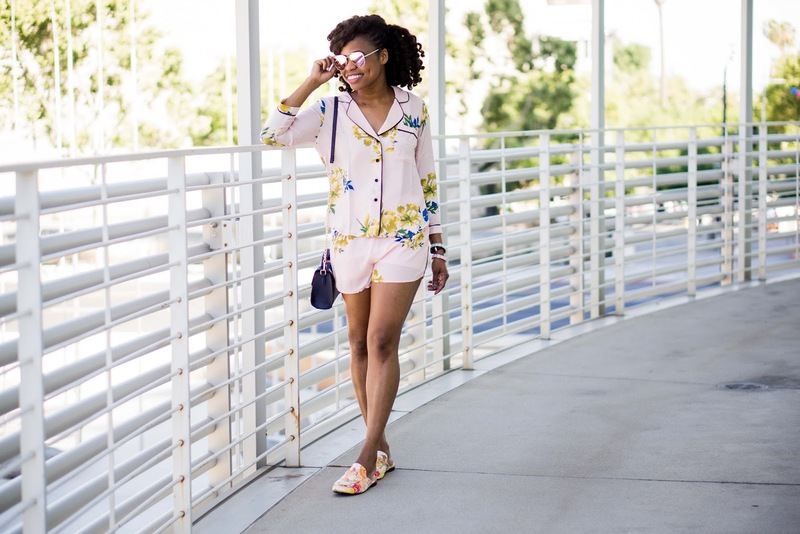 I never would have thought about styling cute pajamas outside of the house!